SYDNEY (Falun Dafa Association) – Hundreds of Falun Gong practitioners will gather at Sydney’s CBD for a peaceful march on July 20, commemorating the 17-year anniversary since the illegal crack-down on the meditative practice began. 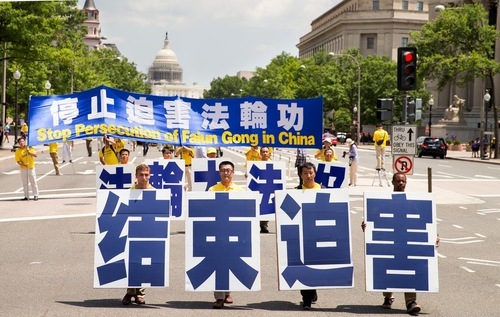 This public event will draw attention to the continuing campaign of oppression against Falun Gong, which has resulted in death and torture of thousands of its followers. The Chinese Communist Party (CCP), led by its former leader Jiang Zemin, illegally outlawed the practice on July 20, 1999. The CCP had reported up to 100 million people were practicing the spiritual discipline of exercises and teachings at the time. Practitioners are calling for an immediate end to the violent campaign amidst new evidence that forced organ harvesting from prisoners of conscience, primarily Falun Gong practitioners, has resulted in up to 100,000 annual transplants and not 10,000 as claimed by the Chinese authorities. Other victims also include Tibetans, Uighurs and House Christians. The new independent report was authored by a team of international researchers, including David Kilgour (Nobel Peace Prize nominee and former Canadian Secretary of State for Asia Pacific), David Matas (Canadian human right lawyer and Queens Counsel) and Ethan Gutmann (investigative journalist and writer). The report concluded that the output of the lucrative organ industry in China numbers in the hundreds of thousands of “forced organ donations” over the past 15 years. The “donors” are killed on demand across hundreds of civilian and military hospitals. The basis of the report is a meticulous examination of the transplant programs of over 700 hospitals in China, drawing on media reports, official propaganda, medical journals, hospital websites and a vast amount of deleted websites found in archive. It analyses hospital revenue, bed counts, bed utilisation rates, surgical personnel, training programs, state funding and more. On the website the researchers stated that: “Governments should enact measures to criminalise the purchase of trafficked organs at home or abroad. They could also require reporting of ‘organ tourism’, ban entry of those involved in trafficking organs, and prohibit their pharmaceutical companies from doing transplant field tests and clinical trials in China”. 1. Mrs Fengying Zhang, 55. Detained for 2 years in forced labour camp. Blood samples drawn and detailed medical examinations performed, including EKG, X-rays and urine tests. Over 100 prisoners were tested with her, 90 per cent of whom were Falun Gong practitioners. Arrived in Australia in 2014. 2. Mr Liu Jintao, 35 year old. Detained for 2 years in Beijing Tuanhe Forced Labour Camp. Blood samples drawn multiple times. Tortured, sexually assaulted, inserted pins into his nails. “One day a prisoner surnamed Jin beat my back and waist area, another prisoner came in and shouted: “be careful, keep his vital organs””. More than 170,000 Signatures on Petition collected in just four months, calling for End to Organ Harvesting. The signatures were tabled in NSW Parliament in April 2013. NSW Parliament is currently in consultation over a law reform which will criminalise transplant tourism, with the aim of deterring Australian citizens from participating in unethical transplant practices. The law reform is proposed by MLC David Shoebridge. The Bill is due for the second reading in Parliament in August 2016. In February 2016 Australian Senate debated the issue of forced organ harvesting in China, initiated by Melissa Parkes, Shadow Assistant Minister for Health.